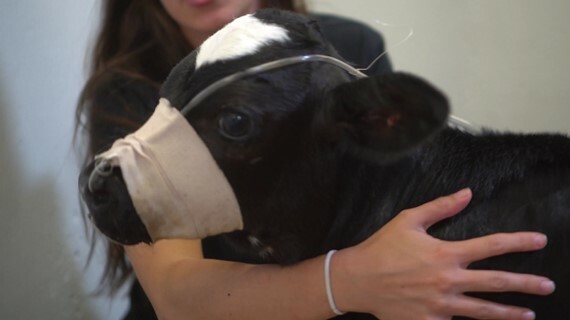 Ask Land o'Lakes to stop torturing baby cows! Baby cows - just a few days old - are taken from their mothers and isolated in small, wooden crates to grow up alone at Zonneveld Dairy. Ask Land O’Lakes to cut ties with animal-abusing farms and reunite baby Roselynn with her mother! Surrounded by other baby cows - yet unable to have contact with anyone - the only world Roselynn knew was a dirty wooden crate on a dairy farm. She had been taken from her mother within hours of her birth. To harvest milk, baby cows like Roselynn are not allowed to nurse naturally - they are torn from their mothers as newborns, and confined in tiny wooden crates. In the space of a bathtub, all calves like Roselynn are confined for their first 2 months of their lives - living in weeks of their own waste. In dairy farms calves regularly die from exposure, infection from filth and malnutrition from not being able to nurse from their mothers. When an all-women DxE investigatory team approached Roselynn, her eyes were stained with mucus, she had visible sores, and she was suffering from pneumonia. Upon further investigation, DxE activist and former Baywatch actress Alexandra Paul found that Roselynn's back end was covered in diarrhea caused by dehydration. Retired San Francisco firefighter Caroline Paul took Roselynn into her arms and carried her out of the farm to safety. The team rushed Roselynn to medical care. A veterinarian discovered Roselynn had a fever and maggots eating away her flesh on her back leg due to diarrhea. Blood tests revealed that she had not received the critical nutrient colostrum - milk that a mother cow’s body only produces during the first feeding. This proved that Roselynn had been torn from her mother as soon as she was born, never having fed from her mother even once. Without her mother’s milk and battling diseases, Roselynn’s lungs were not working properly. She had to be hospitalized and placed on oxygen. Through 24-hour care by many DxE women over weeks, Roselynn made a full recovery. The receiving veterinarian testified that Roselynn certainly would have died if she had not been given immediate veterinary care. Later blood tests revealed Bovine Leukemia Virus (BLV) antibodies. This disease has been found in the breast tissue of human women who consume cow’s milk, and UC Berkeley research has linked it to breast cancer. The USDA reports that BLV is present in 84% of U.S. dairy farms. Despite this diagnosis, Roselynn is expected to live a long and healthy life with diligent care at a sanctuary where she will not be exploited for milk. Like us, cows form deep bonds with loved ones - mother cows cry for days when their calves are taken away from them. Cows on dairy farms are forcibly impregnated every year by humans. When their milk production falters, they are killed for meat. Despite being a farm with welfare reforms, we still found abuse and neglect. True animal protection involves recognizing their legal personhood. This calf still has her umbilical cord on, proving how young babies are taken from their mothers. Regarded as mere commodities to be used for profit, bewildered babies are isolated in row after row of hutches. Roselynn spent day after day in confinement, exposed to the elements and with nobody to show her love. Roselynn is carried to safety by activist Caroline Paul while her sister Alexandra investigates the conditions..
Former Baywatch star Alexandra Paul lifts Roselynn from her hutch and into a new life. Two success stories of DxE’s Open Rescue Network - Pao from a Yulin, China dog meat farm and Roselynn from a California Dairy farm - taking in the comfort of sanctuary life. DxE organizer Rachel Ziegler enjoys a sweet and slobbery moment with Roselynn. Baby Roselynn is always seeking affection, including here with her hero Alexandra Paul. 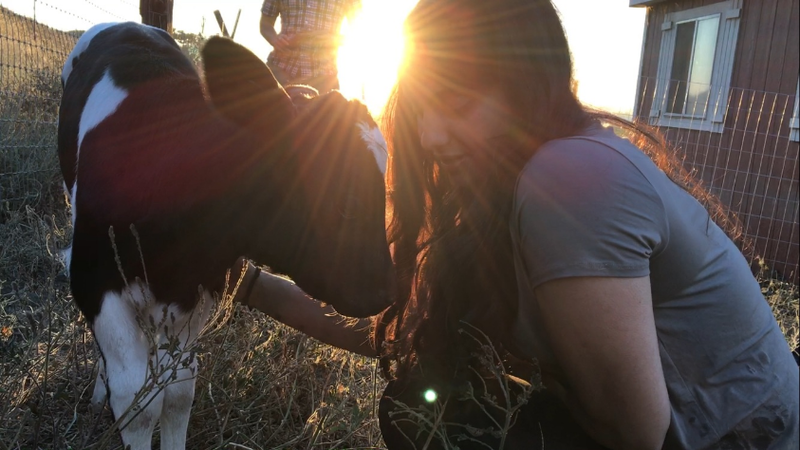 DxE organizer Priya Sawhney with Roselynn, shining light on her new life and a growing movement for animal liberation. With your support, DxE has rescued dozens of animals like Roselynn from horrendous abuse. Through the end of 2017, all donations will be matched (up to $400,000 total) by a generous grant. Any monthly donation makes you a subscribing member of DxE -- a grassroots network for nonviolent direct action for animals. You’ll receive an annual update on DxE’s progress building a movement for animals and access to weekly DxE Discussions hosted by lead investigator Wayne Hsiung. A donation of $45 a month (the estimated cost to care for one rescued animal) makes you a member of the DxE Open Rescue Network, which rescues animals from the most hellish places on earth and places them in sanctuary for the rest of their lives. You’ll receive quarterly updates on rescues and investigations, special opportunities to meet the animals we’ve saved, and access to weekly DxE Discussions hosted by lead investigator Wayne Hsiung. Please notify donate@friendsofdxe.com if a check is in the mail so that we can look out for it! Note that if you would like to request your donations be used for a specific chapter/project, please email almira@directactioneverywhere.com.